Al Falih and Prince Khalid at the signing ceremony. Saudi Arabia is set to float tenders for the construction of a 600 megawatt (MW) solar power project in the city of Makkah in bid to cater to the increasing demand for electricity and clean energy from a booming population. 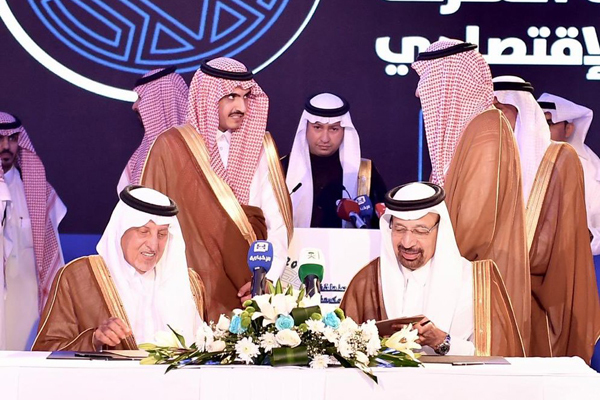 This comes as part of the kingdom's wider plan to build a 2,600 MW project in the Saudi city, said a statement from the Saudi energy ministry. This is an important step forward to achieve the strategic goals of renewable energy in the kingdom, and the optimal utilisation of energy and resources in line with the Saudi Vision 2030, remarked Saudi Minister of Energy, Industry and Mineral Resources Khalid Al Falih after signing the deal with Prince Khalid Al Faisal, the Custodian of the Two Holy Mosques and Advisor to the Emir of Makkah region. The 2,600-MW Faisaliah Solar Power Project is being developed by the Saudi Ministry of Energy in co-ordination with Development Authority of Makkah and is set to be implemented in stages.